Re: Re: Will Catalyst produce and sell more plastic miniature sets? What about using the to hit roll as the cluster table roll? That would eliminate at least one of the rolls you have to do. I don't think the issue with BattleTech is learning curve. It doesn't have much of that really, on the account of relatively shallow tactical depth, which IMO amounts largely to "pick good units and figure out maintaining high TMM while minimizing that of the enemy's, at least on basic level. Though this isn't necessarily a bad thing for a casual game, makes it easy to pick up and play. And if one uses the quick play learning PDF before going into actual game, it is quite simple, my friend at least figured it quickly. But BT is time consuming. Filling in boxes and rolling dice a lot is not part of learning curve of the game itself. I mean, yeah, you get faster at those things the more you do them but that applies to all games and things, not part of BattleTech specifically, and generally speaking isn't the fun part (plus actually having opportunities to play BT seem to be rare, which doesn't really allow one to develop fast dice throwing/reading and paper filling skill...). More modern design tends to avoid time spent filling in boxes or crossing over parts on 4 or more A4 paper sheets, or rolling a lot of dice, even other large scale wargames i've read about (not that many admittedly!) seem to be much lighter on record keeping than BT. Consider Alpha Strike, much reduced dice rolling and record keeping, these alone speed up the game massively. The biggest issue in my perspective with BattleTech is the amount of time and the number of tables required to figure out what happened with the course of action you selected. 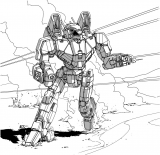 In every case, traditional BattleTech is an enormously bloated and slow game. If BattleTech has too much bookkeeping, look at Alpha Strike rules. Simplifies and speed ups things considerably. Figure copying concepts from other games is fine, as long as the resulting game doesn't feel like a pile of ripped-off rules. Not everything works together well. “Simulationist” is a good word for it. Games of that era, like early 40k, all seemed to do that, presumably because they were more closely related to RPGs. Cinematic rather than tactical. I’m okay with that, particularly because you can switch to Alpha Strike for a different type of game. But I don’t think Classic is tactically too light a game. The modifiers put the focus on movement and positioning, as it should be. You try to get an edge in modifiers and the game is long enough for a small difference to gradually win the battle. I think the big issue is the number of turns. 40k isn’t actually all that quick, it just has a high enough casualty rate that a 6-turn limit is usually more than enough. Fewer turns hurt a game, imo, because they de-emphasize movement (e.g. less payoff for spending time getting into a good position), but they speed it up. 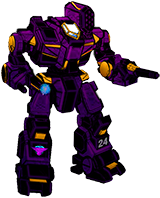 Point is, a quick fix could be to use more highly-skilled Mechwarriors by default. Less quick: a general increase of mechs’ firepower/armor ratios. As a new player, I’d also say that reducing some table look-up rolls to a single die would help. Does it really make sense to blow up just one-third or a torso? Could hit location rolls be a d6, or maybe a larger die that had words on it? You’d have to rebalanced headshots, sure. And I’d consider making LRMs and cluster ammo hit every location evenly. Defender fills in one dot in each location (he chooses the order) before spilling over into a second dot in each location. Too big a change to make without a thorough rebalancing - just something to think about. In the abstract, how about an Alpha Strike game that has some kind of mechanic where limbs fall off or there is some other kind of mechanical sense of armor/systems degredation? In the context of normal BT, what about missiles having a standard dispersion pattern centered around the hit location? i worked on a system like that a while back where your total armor and is was just a big block and various triggers either forcing criticals that might result in a limb blown off. missile weapons kept their crit-seeking value by being able to trigger more critical chances. It's not an easy discipline, that's for sure. A lot of ambiguity and structure all at the same time toward an elusive quarry called "fun". Has any consideration gone towards putting game aids in the beginner's box? For example, having punch out cardboard counters instead of bubbles for armor (1 and 5 denominations work pretty well) or having a cardboard heat tracks with counters to track heat? Maybe using cards instead of dice and tables for some things. Drawing a card from the location deck and if applicable from the crit deck until you get one that is applicable and doesn't say "draw again" would get rid of the table lookup for everything but crit locations where looking at the mech's crit layout is unavoidable. A mix of "crit this slot" and "crit this slot and draw again" and "no crit" cards can replace the number of crits roll, reducing crit resolution complexity. One or two "reshuffle and draw again" cards in each deck prevent players from knowing that eg. all the 11 crits have been drawn and their Rifleman is immune to ammo explosions until the deck exhausts. The statistics might be impractical to get exactly the same and would generally be less streakish which would reduce lethality, but it's a lot easier to draw seven cards for your LBX than to roll and check the table seven times. Crit decks could probably be sold as stand alone items; other RPGs sell them as such. The counters would increase the beginners box price, but might make it more marketable. A couple decks of cards, eight plastic models, and a couple sheets of cardboard punch out tokens is about the same level of "stuff in the box" that some modern board games have, though even the beginner Battletech manual is a heftier piece of printing than their rulebooks. The game board is a bunch of cardstock rather than a fancy folding cardboard thing, though. Not sure how that balances. Maybe it's viable maybe it's not. That's presumably a question to ask the corporate overlords who publish other games and thus have more data on the market than my unsupported speculation. My personal experience is that game aids are a function of a game that expedites the road to experience but doesn't actually do anything to speed up the core of the game. Its kind of like writing down a grocery list so you can reference it later, but the act of writing it down ensured you would remember everything on it and no longer need the list, but driving to the store and getting everything still takes the same amount of time list or no list. I don't think the issue with "speed of play" has anything to do with lack of experience, trouble remembering stuff or anything like that. Battletech at its core is a pretty simple game, 1-2 games and you would be hard pressed to distinguish a 35 year veteran from a 2 game veteran. Yes sure, if you add all of the Total Chaos rules, bring the game up to the current era and layer it with Tactical Operations rules the stuff can get pretty crazy complicated, but if I'm not misunderstanding the conversation here we are talking speed of play of the basic core set, in a normal rules game. How to reduce that, how to modify the rules to expedite this standard game. Short of rules modification, I think there is really only so much you can do. How is learning the hit location chart, which is the same for every Mech, different from learning what other units do in Warmachine? Learning the combinations and interactions between abilities and such. Same concept for X-wing, learning what each ship can do, the abilities that can be purchased. Its different things to remember. I don't think Battletech has any more complexity then other popular games that take time to learn. It may appear dryer, or less interesting, in a sense then some of those games but those tables don't really change. At least for me the way I would put it is that we're having a small comeback and a number of people are legitimately enjoying the mechanics, so I don't see the game going anywhere. But it is fun to talk in the abstract about what changes might do in an abstract sort of way. The major difference is interactivity and the effect those abilities have on the game. A hit location chart doesn't change, can't meaningfully interact with any part of the game besides sometimes the direction of incoming attacks, and has no way to further the evolution of the gameplay experience. It is a constant. You are comparing a parking stall to the concept of street signs. One is a square painted on concrete, the other is a set of directions and interactions that move traffic to a destination. A parking stall is still a necessary part of modern transportation infrastructure, but it doesn't do anything on its own. I suppose it all depends on the goals of Catalyst Game Labs for the game. Is the goal to expand the line to capture new audiences and grow the game, or is it simply the plan to continue the 35 year tradition of keeping with the status-Q? I can tell you as one of the fresh faces who has tried the game that, I love it for the many things that is, but won't be investing or likely even playing the game being the core set for much longer for all the things that it should but never will be. Battletech is a great nostalgic trip down memory lane that I was happy to take for an evening or two with my friends, but if I may be transparent and blunt, the mechanic is archaic and too outdated to really compete with the other miniature games that we play. 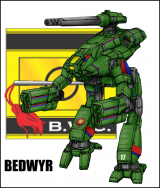 Compared to Warmachines, X-Wing, Armada, Legion, Bolt Action, Bushido and many others that make our table, Battletech really lacks the modernization necessary to keep my groups interest. I might take a crack at revising the rules myself, just because I think its a shame given the wonderful setting and opportunity that Battletech offers, but as it is, its really not going to be a thing. I wonder how do you all feel about the rules changes found in the beginner set? They slightly simplified the rules but it is mostly the same. DO you feel it helps? Did it go too far? Not far enough? A good start? i'll be honest I like games with more crunch than a lot of what I consider the "instant gratification" types. I like battletech because it really is one of those easy to learn hard to master games. its the same reason I like palladium RPG games, and D&D 3/3.5 but more than likely will NEVER play D&D 4/5 because I don't like what they did with the game, Heck, I vastly prefer the old D6 star wars game to any of the D20, or other versions. To be honest at a certain level and in a lot of ways battletech especially the classic/ version especially in 3025 is a pretty simple game, and the only table I never managed to memorize was the cluster table. and I am less familiar with the side arc hit location tables. the front/rear table I think I had memorized by my 5th game or so and still remember it 30+ years later. although the last game I played was over discord about 5 months or so ago and as we were rolling in a "dice roller" room, for hit locations I was noting the location about 1-2 seconds after the roll posted. I also used to have the vast majority of the 3025 weapons table memorized, at least the weight and crits part with the range and damage memorized for the energy weapons. the problem really comes down IMO to people who in some ways come across (at least to me) as wanting things simplified down to the point at which too many of the "newer" games just feel like different versions of the same basic mechanic. kind of like all the mobile device base builder games they may have different "resources" but its all resource 1,2,3 sometimes with a "money" resource, and always with a real cash resource. but if you have played one of those games you can skip 90% of the "training" on how to play. I play Bolt Action, Armada and X-Wing and I love all those games for different reasons. Above all though I love Battletech and I would hate it if they tried to make it more like those games. Battletech is unique compared to other games and I look at games like X-Wing as gateway games to more complex and interesting games like Battletech. I do believe minor tweaks can and should be made to the core game but to radically overhaul the entire game would be a huge mistake. Yeah I'm not sure I would call Battletech a more complex game than any of the fore mentioned games from a tactical or strategic perspective as a game. Perhaps X-Wings simplicity might be something in the range of Battletech but I would call Battletech more complex as a rule system than anything else. As a tactical game Battletech is extremely simple (he says in the sweetest most non-aggressive voice possible). Consider what you actually control in Battletech from a player agency and tactics perspective. You can move your mech into a position using the terrain to get optimal modifiers towards dice rolls in the shooting phase. Your entire player agency boils down to this one action. Its a game that is pretty much in its entirety about what hex you leave your unit in and how he got their which effects his offensive and defensive modifiers. Everything from that point is left purely up to lady luck. I understand the game has statistical curves thanks to the 2d6 mechanic and some basic resource management (heat) but I wouldn't call any of that complex. The rules of resolving everything, that is where the complexity of the game is. Am I wrong here.. what more is there to the strategy of the game beyond you position on the map? Consider for example X-Wing which was mentioned as a gateway game. I challenge that because while the mechanic is much simpler to understand and absorb the strategic depth is 100 times that of the movement phase in Battletech. The simple act of using hidden movement means that you have to guess at your opponents plan, the position he is trying to get all of his units in and use your own movement strategy to find a way to come out on top. That alone makes the movement of X-Wing soooo much deeper. I mean in Battlemech you randomly determine initiative so you can't even do anything to effect the order in which units will move, while in X-Wing you have pilot skill which determines the order of movement and shooting. Again just another layer of depth, done very simply. Just saying I think this community really oversells the tactical depth of Battletech, I mean from a tactics and strategy perspective I can't really think of a simpler miniatures game then Battletech. If I were to categorize the game, it would be in the "dice chucker" category were it not for how complex the rules for dice chucking are in the game. Do you have specific examples of what you're thinking? The challenge here is modernization without looking like a copycat. Copying someone else's elements is a good way of both showing poorly to new players ("hey, they just ripped off X") and alienating your current players. It's a fine line to make work. Don't roll for hit location. Weapons deal one-third damage to the Centre Torso, with a critical chance on an MOS of 4+? TBH, I'm certain there are lots of tweaks that the game could use...it's deciding which ones will be "popular" is difficult. Doubleblind rules make the game much more tactically sophisticated (you can only see in your los) but it’s not at all suited for tabletop because you constantly have to check los and keep track of where your units are since they’re not on the board unless your opponent can see them. You left out determining which unit to move when. And having to move units in anticipation of what later units will move. Considering how much you play up X Wings blind movement, leaving that part out of BattleTech is leaving out something very important. Yeah, if you're playing BattleTech 1v1, it's just initiative roll. Anything larger, and which unit to lead with, where has the enemy already moved, which units does the enemy have left available, what can they do and what can you do in anticipation of those moves, is huge. I think BT would do well with a more streamlined version. Way more simplified than Alpha Strike. otherwise it will be kept as a niche nostalgia game forever. One that you crank out of the box once or twice per year, but not on a regular basis. We play Alpha Strike right now, but we are in constant talk about simplifying the system A LOT. Only the work involved in recalculating all the troop stats (massive!) keep us from doing that. Because the universe is great (even if it has a lot of BS as well, buit so all the universes, really), but the games are not that great. They tend to be towards the low end of "greatnes", really. At least not for the tastes of my group. Which unit moves first or last, is such a minor aspect of the tactical options it’s barely worth mentioning, hardly the final piece that raises BattleTech from the simple dice chucker it is to the “complex tactical game” it advertises to be. Is there anything else you can point to that you would quantify as tactical depth in Battletech? I guess I’m just trying to understand where the term “complex” is used to describe Battletech beyond the complexity of the rules? I... really? I don't even know how to process that. Movement has always been a massive part of the game. How can that said to be a minor aspect? It's the thing. Seriously, if you're not putting a great deal of thought into which unit moves when, perhaps that's why you don't think it's complex. It dominates everything up to and including what units I want to pick. You can just mash the fire button if you'd like, but you'll be doing it from where I want you to be. (Or I messed up my tactics). choosing which unit to present as a target. making the other player choose between continuing focus fire on the one they've damaged that's now a harder target, or the easier targets. using bubbles of doom to force other units out of position. using line of sight to break concentrated fire. finding the advantage in range and making sure you can exploit it as much as possible each turn. choosing between conflicting priorities (defending damaged targets versus concentrating fire on enemy target for example). I disagree with your analogy moving traffic along. Warmachine, X-Wing and others all have unit cards, skill definitions that need to be read and absorbed. They serve the same purpose IMO. 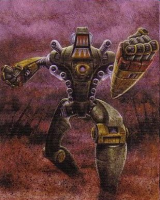 Modern games are bring back the data sheets and unit cards which Battletech has had since it started. Those are all fundamental to those games, just as charts are for Battletech that create a game based on different tactical use of units than having the right super combo to spring on your opponent. I'm not saying those games aren't based on use of units, I just feel they are more combo driven tactics than the "hard sci-fi" nature of battletech this I find enjoyable. I understand your statement about the evolution of the game play experience and I think some games evolve more to generate revenue than to actually improve the game. the biggest problem here is that you're basing your entire analysis of the game based on the introductory rules - which hasn't been the entire game since 1986. The base game isn't complicated, no. The layers of optional rules exist to make the game more sophisticated. If the base rules leave you found wanting and choose not to utilize them, that's on you. I noted two options just in the movement phase that add a decent level (lance movement), and large level (simultaneous movement) of tactical depth. Add in a half dozen unit types, synergizing weapon packages, defining combat roles, and using tactics that include artillery, infantry field guns, minefields, smoke, etc create a very rich battlefield. And it's not that complicated if you've played with the advanced rules more than five times since 1991.
all the total randomness you claim the game has melts away pretty quickly when you apply the extra layers. i've noted that the dice rolling is tops on my list of pet peeves, but the outcome is really left to a ton of chance between two players of equal skill. If you're playing small games, there will be flukey outcomes, but in the balance the results won't be random. All the dice rolling largely just delays the outcome. They've already committed to reprinting the Alpha Strike rules in a compendium, reprinting the core rulebooks, and issuing the new box sets. That's pretty clearly the strategy for the line. That's why I say it's a discussion in the abstract as I don't expect major changes to this. Trust us, the order in which you move your own units is a HUGE part of the game. Many players prefer to move slower units first and fast units last(in order to flank/backstab units that have already moved), but there's so much more then that. Do you sacrifice a fast unit by moving him early onto a critical bridge, preventing enemy units from crossing for a vital turn or two? Do you move your infantry first as 'initiative sinks', or do you hold off in the hopes that they'll be overlooked and you'll get the chance to move them in for a back shot or leg attack? Do you grab that really good stand of trees early on, or do you let the other guy move a unit or two first, then grab it once he's committed to that advance and your presence throws everything into disarray? Do you take advantage of the fact that players rarely bother to look at their opponents' sheets and move your units slowly early in the game, then shock him later on with a sudden and rapid advance that he didn't think you were capable of? I think you might have missed my point. The hit location chart doesn't do anything. There is a minor, not particularly reliable difference in shooting from far enough to one side, but it doesn't change how the hit location chart works. It's an unmoving constant that does very little to meaningfully enhance or improve the game that it's in. Conversely, most (regrettably not every) unit ability or upgrade in the games you mentioned substantially affect the flow of play. It's not always beneficial, but it's undeniable that Luke Skywalker has a different effect on the game than a Blue Squadron Rookie. The two are not the same, and calling them the same is both misunderstanding the point of my analogy and not recognizing what actually contributes to player engagement. EDIT: I realized after hitting post that I could explain it more easily. Unit abilities and special rules are something that players can use and interact with. The hit location chart, on the other hand, is just something that happens to people. There's no interaction between the players and table; it's a mandatory stopping point to the game's momentum that is entirely dedicated to finding out what had already happened. part of my analogy and comment really comes down to another analogy, would you rather play checkers, or chess? my feeling personally is that battletech is more akin to chess, in that the rules are fairly simple but the interactions and choices made during a game are or can be very complex. most of the "modern" games are as mentioned in a lot of ways more simplistic when you get to the actual play stage. I mean in xwing the complexity has nothing to do with the choices made when you show up to actually play, its all in the Loadouts you bring to the table and how the abilities interact to break the base rule set with special rules and skill interactions.